Thank you for your support! Show medical institutions that you think this would help patients. Your support will help us produce version 1.0 and do our first production run so we can make the binder low cost or even free for patients, doctors, discharge planners, and hospitals to get and give to patients who need them most. You also get a tax deductible receipt for this and all rewards here. Thank you! You can make a major contribution to development. 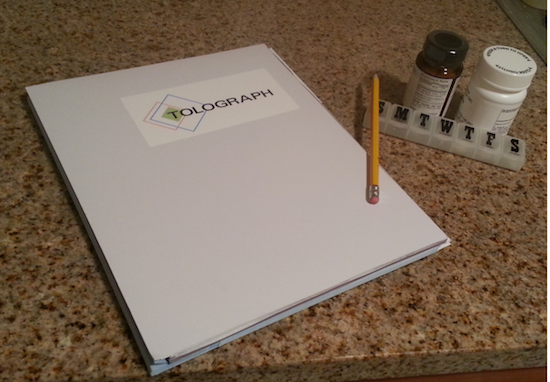 You’ll receive a T-Shirt with the slick retro Tolograph logo. Hospitals and Clinics: For $950, you will receive an early prototype of the institutional version, accessories, and five binders to give to who could use it most. Do you or a loved one have a hard time keeping track of your medical records? Think about where you keep all the papers you received from doctor visits and hospitalizations. Are they organized? Have you lost any? Ever go to the doctor and forget what’s said? Patients forget over half of what the doctor tells them. One study found that patients forget up to 80% and nearly half of what they actually recall is incorrect. poor outcomes. Getting patients to remember and understand doctor’s orders is crucial. The challenge is to make it overwhelmingly easy to follow those instructions. When a patient goes to the doctor or is hospitalized, they are sent home with a computer printout with instructions for taking meds, exercise, follow-up, etc. These written summaries can be too complex or simply too dull for most patients to read. Giving these vulnerable patients a piece of paper to manage their heart disease is not safe. Care coordination and social work is effective but needs a boost. Devices with touchscreens and web applications only intimidate the majority of patients. The Audio Binder: Here’s a super simple way to keep all of your medical information in one place. It’s an accordion folder for storing medical papers with an audio recorder embedded in the inside cover for capturing the doctor’s important verbal instructions. It also has a USB port for keeping electronic medical records if you have them. Patients love it because it helps them remember every bit of medical information. Providers and case workers love it because they know patients don’t always read their written instructions. The Audio-Binder swaps dry, written documents into living, meaningful instructions for survival. This is a simple, low-tech device that anyone can operate. And at a low price! During a doctor’s or nurse’s key instructions, just press record. For offices with paper instructions, providers can put those in the folders so the patient knows the audio is just to clarify some of what’s written. Patients can keep everything in here from lab results, to scans, to receipts and insurance information. You can write in pen or pencil anywhere on the binder. The last tab is blank so you can label it as you like. The binder expands to accommodate a lot of papers. This recording can be played using the audio control panel, which features large push-buttons, a loud speaker, and over 100 hours of high-definition storage. It can be used again and again. It also can be plugged into any computer and holds files just like a flash drive – with no software required. I’m also developing another version for hospitals and large practices. This version has a wireless component that saves a digital copy of the audio file for the hospital’s medical records. The responses so far by administrators and clinicians have been overwhelmingly positive. They love it because of the simplicity and the ease of implementation. It’s plug and play and the IT department doesn’t need to lift a finger. Previous studies in cardiovascular and oncology patients show that patients listen to recordings of their doctor and find them helpful. A study of a similar technology showed that audio recording of live discharge instructions reduced readmissions and dramatically improved understanding of treatment for patients and their families. This study required patients to log onto an Internet portal or call a voicemail to listen to their discharge instructions. The Audio Binder is a lot simpler because everything is in one place. 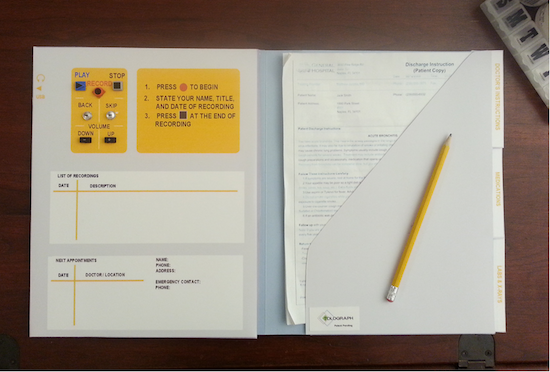 I am supplying Audio Binders for a 50-patient trial at an NYC hospital. We are awaiting IRB approval. The trial is designed to inform near-term development through interviews with patients, their support networks, and outpatient physicians about features, sentiments, and use cases. It will not yield statistically significant results, as that information requires a much larger trial. A larger trial could be used to test readmission reduction, improved outcomes, and increased patient satisfaction scores. I am not designing such a trial now but I am more than happy to consider a project with the assistance of a grant. Physicians, nurses, care givers, and case workers: Imagine how much better informed and engaged your patients will be with the Audio Binder. They’ll love you for making care instructions so easy for them. You will be known as an early adopter of a new technology and an innovator in participatory medicine. If our donation goal is met, I will use it to hire manufacturing specialists that can make the Audio Binder low-cost so anyone who needs it can get their hands on one. I want to make it affordable for hospitals to give them for free to their patients. I am Peter Fishman, the sole operation: inventor, designer, builder, clinical trial writer, and unpaid employee. I have been in healthcare for thirteen years. I started out as a trial coordinator at a cancer center. I have worked in health economics, outcomes research, marketing, pro-bono consulting, patient assistance at a hospital, and am a long-time electronics hobbyist. For all you makers out there, you can see my prototyping lab in the video. 1. Kessels, R, et al. “Patients’ memory for medical information.” Journal of the Royal Society of Medicine 2003;96:219-222. 2. Leahy, M. et al. “Audiotaping the heart surgery consultation: qualitative study of patients’ experiences”. Heart 2005;91:1469–1470. 3. Santo, A. et al. “Exploring the value of audiotapes for health literacy: a systematic review”. Patient Education and Counseling 2005;235–243. 4. Bailey, C. “Reducing readmissions through discharge communication.” Nursing Management. Vol .43 No. 12 (December 2012) – Supplement: Safety Solutions Pages 14 – 16.